With better weather comes more home improvement projects. One of those left over from the long list of things the house inspector left us when he inspected this house before we bought it is installing an electrical outlet in the kitchen to replace a line that we've never used on account of it was contrary to building code. Besides, when the contractor replaced the cracked under-floor beam, they ended up pinching the line anyway. Lisa's plan was to drill a new hole up from underneath the house, run conduit through the hole back to the place where the sub-standard wires came from, and run new wires through the conduit and up to the place where the (never used by us) outlet is. 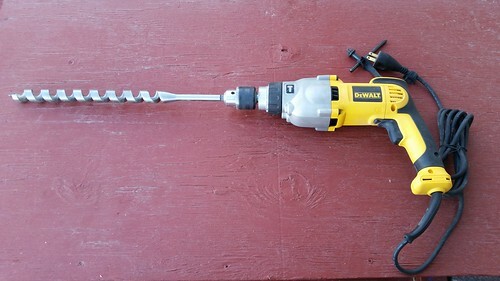 Lisa wrestled with her cordless drill and a not-long-enough drill bit for the desired one-inch hole for more than an hour, running through two battery charges, before determining that we just didn't have the right tools for the job. It was time for another trip to the hardware store. Back when we were building the carport shelter, we had bought a heavy DeWalt hammer-drill for drilling holes into concrete. Here it is with the long drill bit we bought from Big R. We ran an extension cord down under the house, Lisa plugged in the drill, set it to normal (non-hammer) mode, secured the long boring bit, and proceeded to punch through the floor in about two seconds. That drill bit cost about $40, but if we hadn't bought it, Lisa would probably still be trying to struggle to get the hole drilled. The right tools for the job and all that. With the hole bored, Lisa called it a day. She'll return to this in a couple of days. The work is tiring and time-consuming, as she has to get kitted up with ear, eye, and breathing protection and crawl around under the house, accessing it from a trap door located in the kitchen. She reports that it's quite dry under the house, which is good; it means that rain and snow aren't getting in and causing mold. Lisa made accessing the crawl space slightly easier this past week by putting one of the mini-pallets on which our fire logs are packed down in that space, so it's not quite as much of a drop from the kitchen trap door to ground level. When Lisa runs the conduit and electrical lines for the new/replacement kitchen outlet, she intends to also install a power outlet under the house branched off that line. That will make any future work that needs to be done down there with power tools — and there probably will be some, as this place is an ongoing project — it will be much easier to connect them.